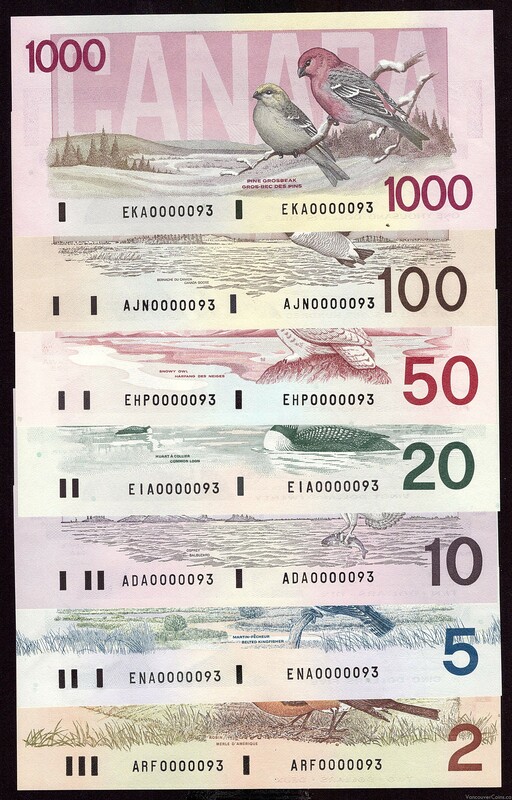 Canada VIP Bird Series $2 to $1000 banknote set all #0000093 all GEM UNC67+ - Professional Dealers of Coins, Bank Notes and Bullion. This set is not from any of The Bank of Canada sales which sold much higher matched number sets. It is an extremely high quality set with each denomination featuring the first prefix of issue as well as the very low two digit serial number of the 93rd printed issue of each denomination. This set was gifted to an extremely important Government official of The Bank of Canada, who in turn sold the set to Vancouver Coins. A set of the highest quality grades which would challenge all other rare issued Bird series notes.